Minnesota Senator Al Franken agreed to participate in an ethics investigation after being accused of groping a radio host. Minnesota senator Al Franken said he would cooperate with an ethics investigation after radio/TV host Leeann Tweeden accused the then-comedian of “forcibly” kissing and groping her without her consent during a USO Tour in December 2006. According to Tweeden, Franken forcibly kissed her while they rehearsed a skit the comedian had written for the two of them. The skit had called for a kiss, which Tweeden said she figured she could avoid onstage, but backstage she claimed Franken “put his hand on the back of my head, mashed his lips against mine and aggressively stuck his tongue in my mouth.” Additionally, as the members of the USO Tour flew back to the United States from Afghanistan, a photographer took a photo of Franken grabbing Tweeden’s chest while she slept. Following the publication of Tweeden’s account, Senate Majority Leader Mitch McConnell called for an ethics review, which Franken has since seconded. 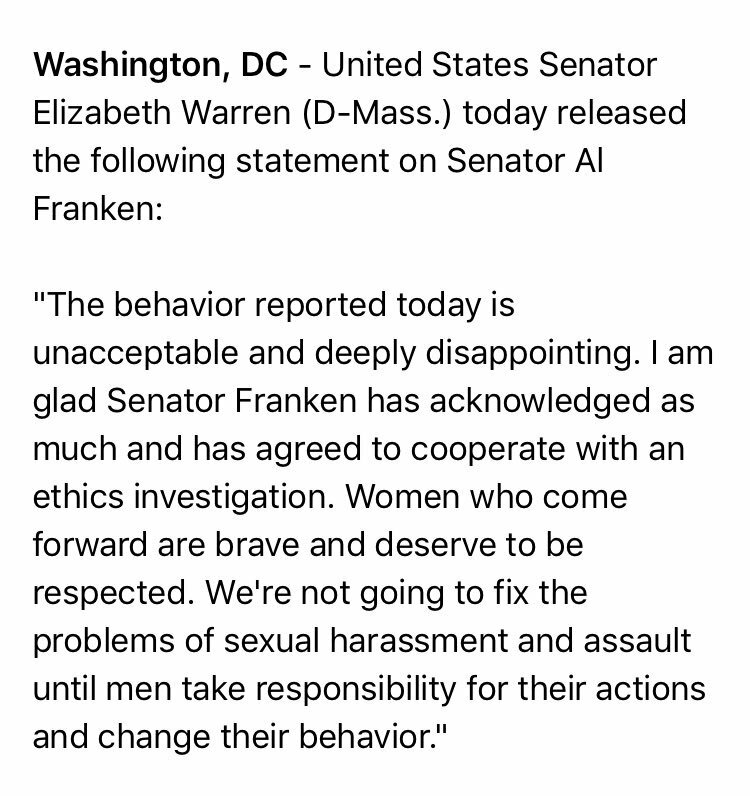 Several of Franken’s Democratic colleagues, including Minority Leader Chuck Schumer, Missouri’s Claire McCaskill, Minnesota’s Amy Klobuchar and Massachusetts’ Elizabeth Warren have also called for an ethics review. The first thing I want to do is apologize: to Leeann, to everyone else who was part of that tour, to everyone who has worked for me, to everyone I represent, and to everyone who counts on me to be an ally and supporter and champion of women. There’s more I want to say, but the first and most important thing – and if it’s the only thing you care to hear, that’s fine – is: I’m sorry. But I want to say something else, too. Over the last few months, all of us – including and especially men who respect women – have been forced to take a good, hard look at our own actions and think (perhaps, shamefully, for the first time) about how those actions have affected women. For instance, that picture. I don’t know what was in my head when I took that picture, and it doesn’t matter. There’s no excuse. I look at it now and I feel disgusted with myself. It isn’t funny. It’s completely inappropriate. It’s obvious how Leeann would feel violated by that picture. And, what’s more, I can see how millions of other women would feel violated by it – women who have had similar experiences in their own lives, women who fear having those experiences, women who look up to me, women who have counted on me.